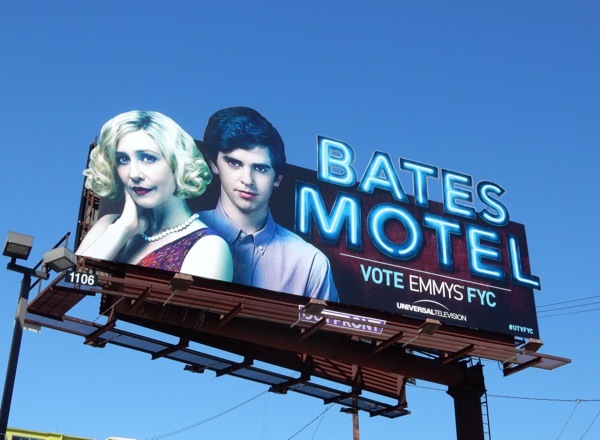 If anyone involved in television ever tells you that awards and accolades are not important, don't believe a word of it, as Emmy consideration billboards have exploded throughout the L.A. skyline this past month and it's getting even more crowded of late. 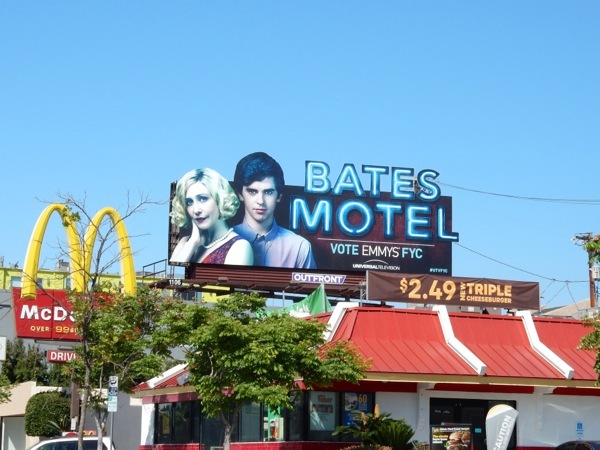 To the casual observer and those not in the business, these billboards can often be a tad confusing as some ad campaigns are actually for the studios where the series were filmed and not the network or channel they aired on. 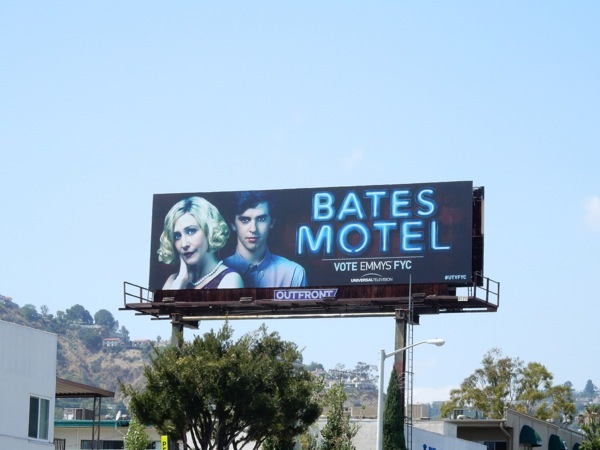 In this instance here's a collection of TV shows produced by Universal Television but available on the likes of A&E, Fox, NBC and Netflix, but all part of the same cohesive 'Vote Emmys FYC' outdoor ad campaign. 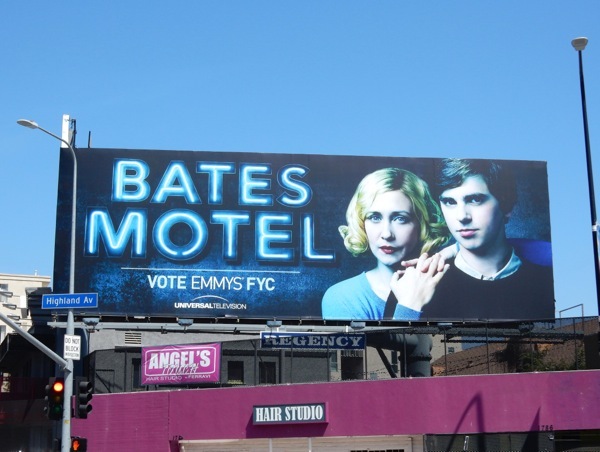 First up are Emmy consideration billboards for the third season of Bates Motel, the Psycho movie prequel series starring Vera Farmiga and Freddie Highmore. Last year Vera Farmiga was Emmy nominated for her performance as the disturbed 'Norman Bates' mother, 'Norma'. Will lightning strike twice this year? 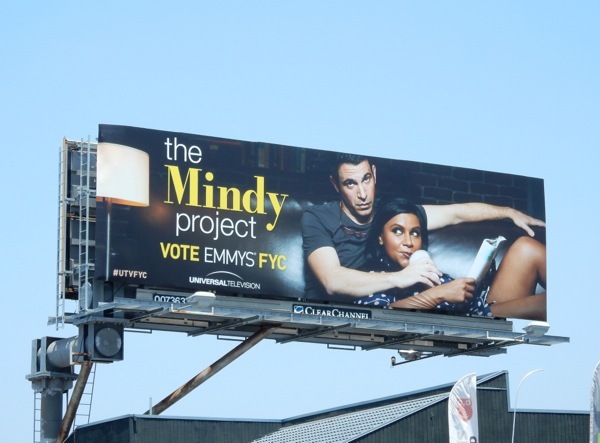 These Emmy billboards were first snapped along Highland Avenue on May 28, whilst the other ad creative was spied along Fairfax Avenue on June 5 and the eye-catching special extension version was spied along Santa Monica Boulevard on June 7, 2015. 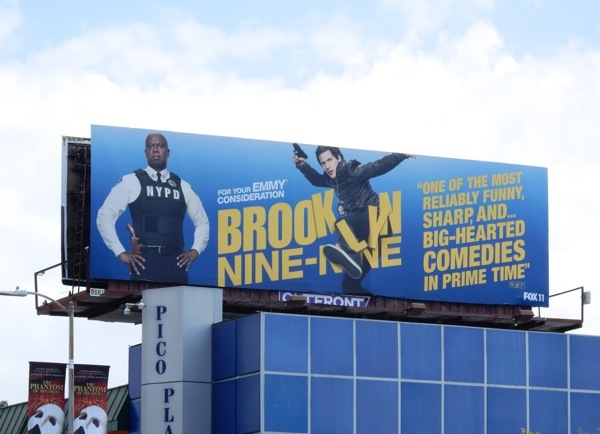 Next up are a variety of billboards for police station comedy, Brooklyn Nine-Nine, now in its second season, but already confirmed for a third. Andy Samberg has already won a Golden Globe for his role as 'Detective Jake Peralta', so can he add a Primetime Emmy nomination and add another Emmy to his Saturday Night Live win. 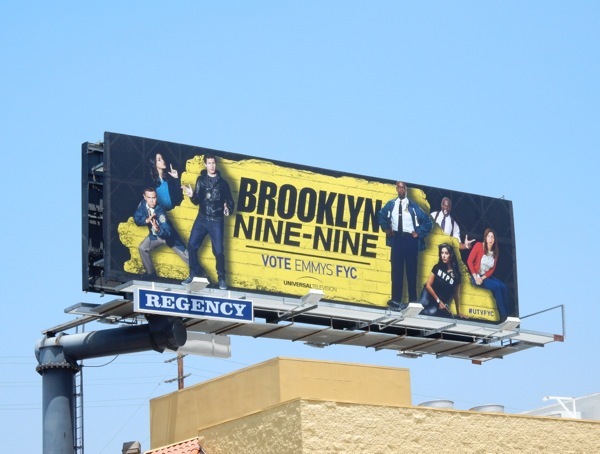 The yellow Brooklyn Nine-Nine ad creative and special extension versions were snapped on June 2 to June 3 along Overland Avenue and Highland Avenue, respectively. 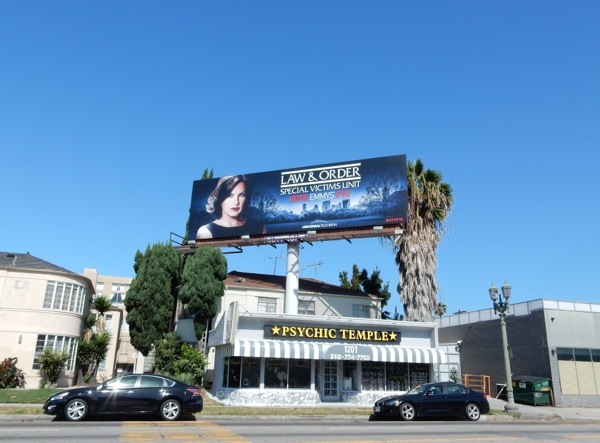 The slightly different blue billboard design actually seems to be from Fox, the channel on which it airs, and was photographed along Pico Boulevard on June 5, 2015. 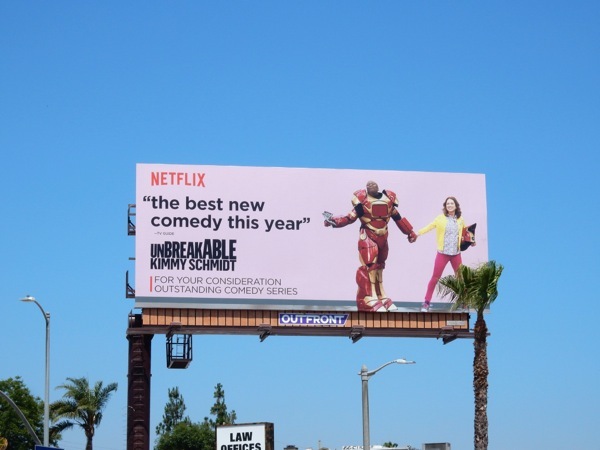 Netflix's breakout comedy Unbreakable Kimmy Schmidt really stands out in L.A.'s skies with these hot pink billboards. 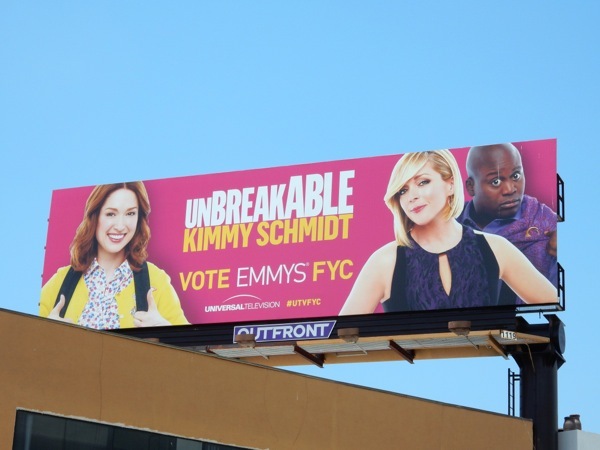 If you're fan of the show about an ex-cult member (played by Ellie Kemper) given new lease on life in the Big Apple, be sure to enjoy these series premiere billboards for Unbreakable Kimmy Schmidt too. 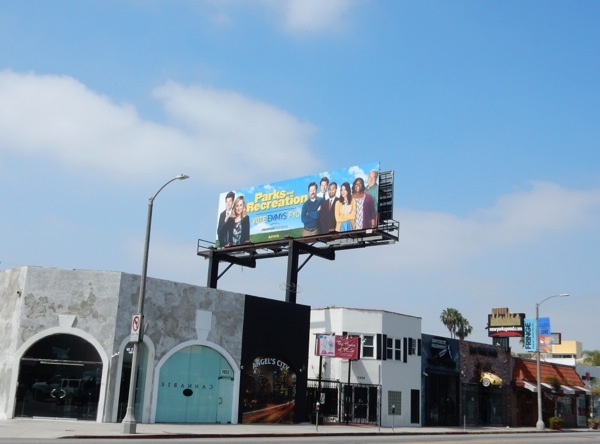 These Emmy consideration billboards for the comedy's debut season were spotted along Westwood Boulevard in West L.A. on June 5 and along Wilshire Boulevard a day later. 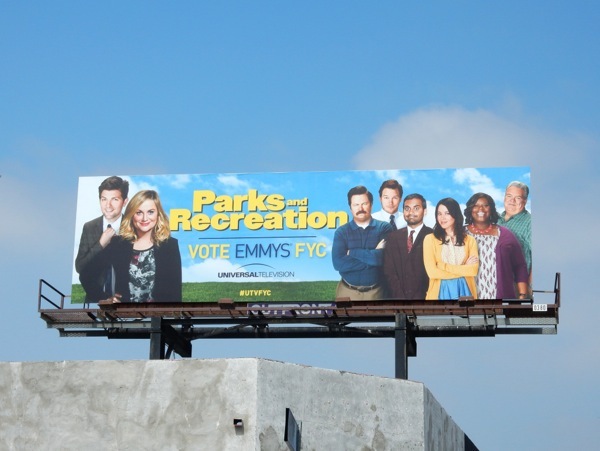 From a new comedy to a show bidding farewell recently with it's final seventh season, NBC's Parks and Recreation. 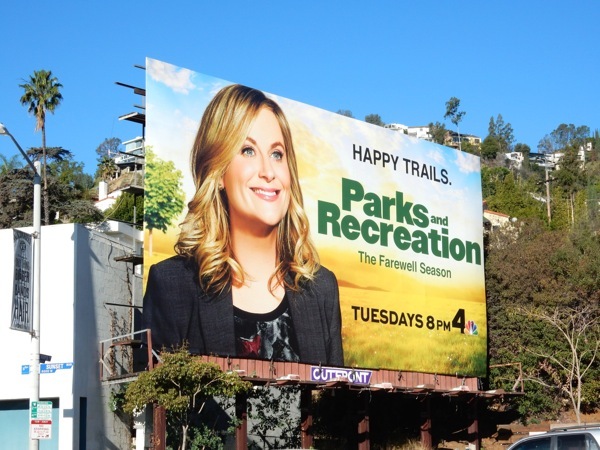 Here's a special bonus final season billboard for the mockumentary series starring Amy Poehler set in Pawnee's parks department, snapped on January 14, 2015. 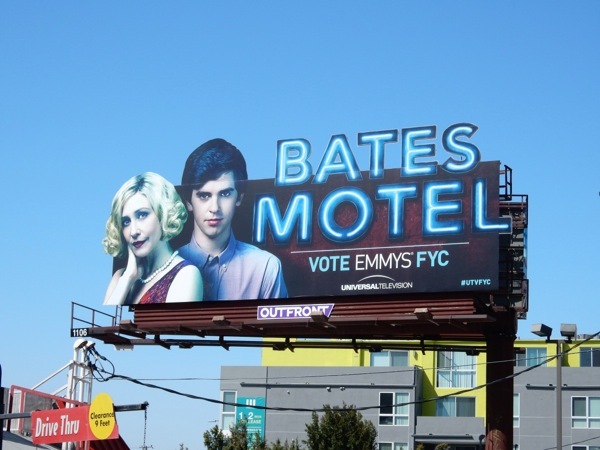 Meanwhile this Emmy consideration billboard featuring the rest of the cast was photographed along Melrose Avenue on May 28. Will their 'happy trails' end with an Emmy as Amy Pohler has been nominated for Outstanding Lead Actress the past five years? If you're a fan of the show, be sure to also check out these original props from Parks and Recreation on display at Universal Studios Hollywood to help commemorate the series. Even though Fox cancelled The Mindy Project after three seasons, the end if not nigh for Mindy Kaling's much beloved sitcom, as it moves to Hulu for a fourth 26-episode season. Maybe that's why the titular star and Chris Messina are looking so relaxed for their Emmy consideration close-up, snapped along Overland Avenue on June 2, 2015. An award win would surely be a great way to start her daring new chapter. 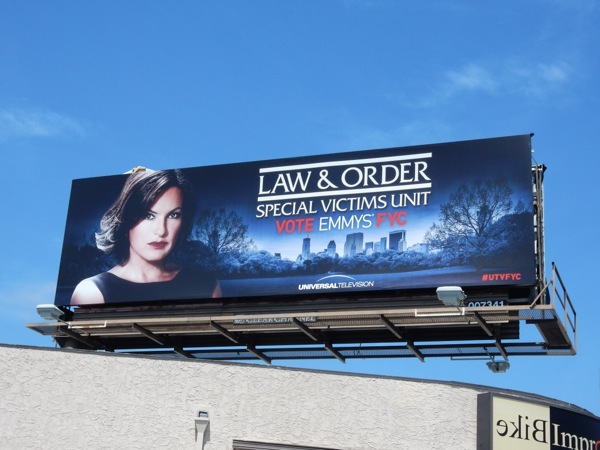 Even though Law & Order: Special Victims Unit, or SVU for short, just celebrated the sixteenth season of the crime procedural, it looks like Mariska Hartigay's 'Olivia Benson' isn't going anywhere as she'll return for a seventeenth season of episodes. Can the 2006 Emmy-winner, with eight nominations to her name already, make it nine times in a row? 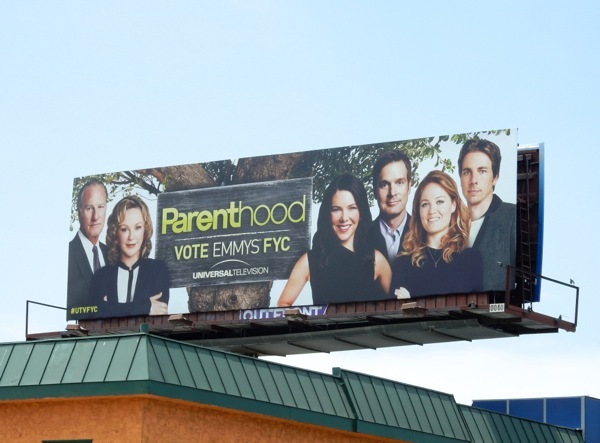 Another acclaimed series that came to an end this year was NBC's Parenthood, loosely based on the 1989 film of the same name, and this billboard was spied along Pico Boulevard on June 5, 2015. Can the sixth and final season of the drama chronicling three generations of the 'Braverman family' take home an Emmy to help soften the goodbye? 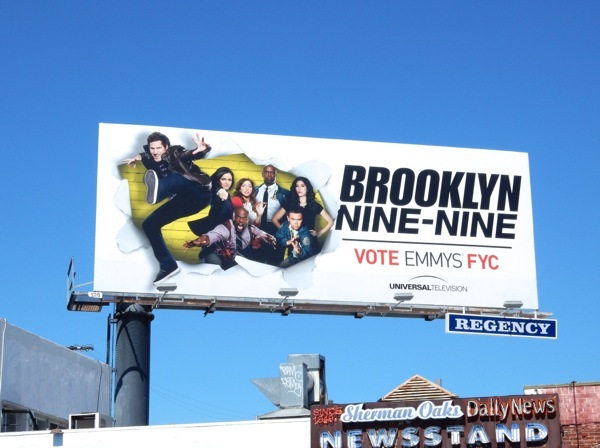 If you liked this Universal Television Emmy campaign, be sure to also compare them to HBO's cohesive 2015 Emmy consideration billboards and stay tuned in the days to come for even more outdoor campaigns striving to get industry voters attention in the skies of Los Angeles. UPDATED: In the same way that Brooklyn Nine-Nine had ad creatives from both Fox and Universal TV, so too does Unbreakable Kimmy Schmidt, with this extra Emmy support from Netflix, where the rookie comedy streams. 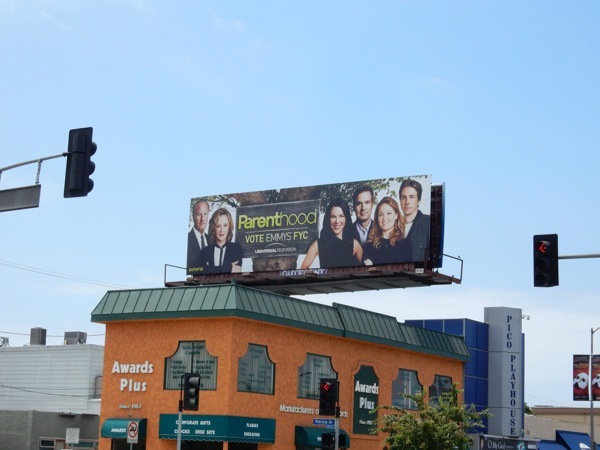 This hilarious billboard was spied along Ventura Boulevard in Studio City on July 5, 2015. 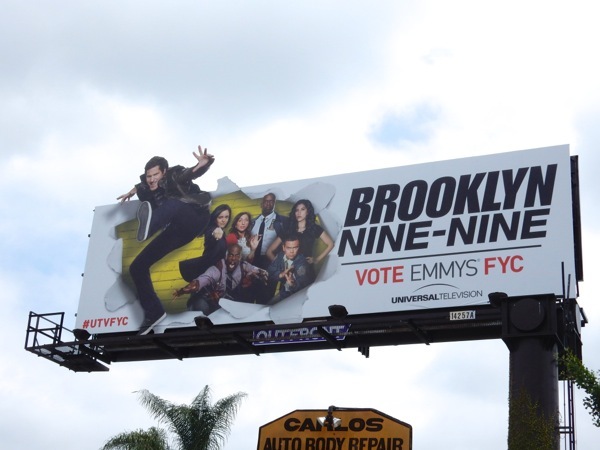 UPDATED: Here's also another version of the Brooklyn Nine-Nine Emmy creative with Andy Samberg bursting through the billboard hoarding, snapped along Ventura Boulevard in Sherman Oaks on July 14, 2015.